This is one of the most incredible versions of the traditional Egg Bag effect that has ever been released to the magic fraternity. Because of the direct and simple effect of an egg appearing and disappearing in the bag, the Egg Bag is considered to be a classic magic effect. 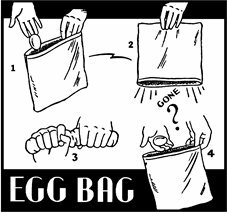 It is not surprising therefore that many professional magicians feature the Egg Bag in their act at some point in their career.